We have just a few swimmingholes so far for this state so these are presented without a "clickable" state map at this time. Branson Shows is a Missouri company with 15 years experience, and has been active in finding the best ways to "Beat the Heat" this summer. We have compiled a Top 10 list of the best places to take a refreshing swim, and get the best in depth swimming lessons. Some of these even offer training for scuba diving! Nice swimming spot with places to jump and a rope swing. Bathing suits are customary, however if you move down stream no one will bother you if you choose to go without. From I-44 east of Joplin, take exit 18A and go south on RT 59 about 10 miles. There is a sign on the highway directing you to turn east (left) on Greenbrier Dr. then take an immediate right onto Otter Dr. and continue to the creek. The swimming hole is here. Also known as "Pecker's Beach", this is a long-time swimming hole on the east side of Springfield on the James River. The county monitors the water quality here at WEB SITE . From I-44 in Springfield, take Exit 82A and go south on RT 65 (Schoolcraft Fwy) to the Battlefield Rd. exit. Go east on Battlefield Rd. then turn right onto S Farm Rd 187 and go 0.2 mi then take a slight left onto E Farm Rd 164/Kinser Rd for 0.7 mi then take the 3rd left onto S Farm Rd 193 and go .4 miles then the Creighton Access will be on the right. 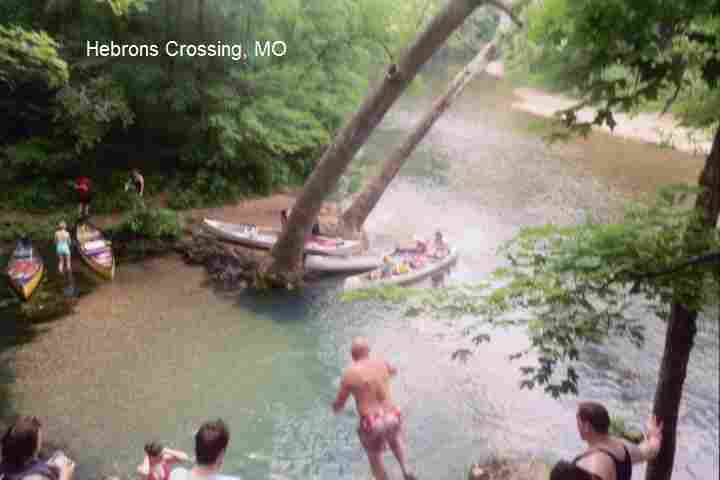 There are many swimming holes and opportunities for tubing and canoeing in the clear rivers and springs in southeastern Missouri - in the Ozark Mountains and the Mark Twain N. F. area. The Jack's Fork River, the Current River, the Eleven Point River and Rocky Creek are some of the main watercourses thorough this area. LINK TO PHOTOS OF LOTS OF SPRINGS near Eminence . See DIRECTIONS below for details on some swimmable places. There are several campgrounds in the Mark Twain N. F. CLICK HERE for information. .
RIVERS EDGE RESORT [RIVR]: A commercial resort on the Jacks Fork River in Eminence with lots of river activities, including swimming and floating. No apparent day use - must stay at the facility. No camping. RESORT WEB SITE , YOUTUBE . To get here, from Eminence, take RT 19 (Main St.) north a short distance to the bridge over the Jacks Fork River. Cross the bridge and turn immediately left on Tom Akers Rd. and the resort is here. The address is: 501 N Main Street, Eminence Missouri. Phone 573-226-3233. (On the other (south) side of the river, across from the resort, is the Butin Rock Access which has a boat ramp and may be a good swimming place too.) LAT, LON lat=37.15546, lon=-91.35904(source: Map) (accuracy: exact) LINK TO GOOGLE MAP. RIVERTON [RIVE]: A swimming hole on the Eleven Point River at the Riverton day use area with good access to the river and a nice sand beach. Fast current and cold water but a great swimming hole. The Eleven Point River is said to be the most pristine river in the Ozarks area and is a popular canoeing stream as well. To get here, from Eminence, take RT 19 south through Winona to Alton then turn east (left) on RT 160. Go about 14 miles on RT 160 to where RT 160 crosses the Eleven Point River. The Riverton day use area and swimming hole are at the west side of the river bridge. LAT, LON lat=36.64850, lon=-91.20144(source: DeLorme) (accuracy: exact) LINK TO GOOGLE MAP. NORTH FORK RECREATION AREA [NORT]: Swimming hole on the North Fork of the White River with a nice beach, also known as Hammond Mill Camp. Developed National Forest camping at the site. To get here, from Eminence, take RT 19 south through Winona to Alton then turn west (right) on RT 160. Follow RT 160 west to West Plains. 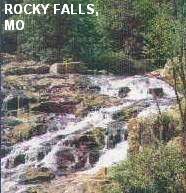 IN West Plains, take RT cc west 16 miles to the North Fork Campground. The swimming hole is here. LAT, LON lat=36.7546, lon=-92.1526(source: DeLorme) (accuracy: exact) LINK TO GOOGLE MAP. Also down stream from the main area approximately 1/2 mile, but still part of the park, is a good size spring in a cove which spills into the river. The spring is about 5 feet deep in the middle, with a small bluff of about 10 feet on the edge. It's a very easy jump. BLUE SPRINGS [BLUE]: Beautiful, crystal-clear swimming hole the Jacks Fork River. There is canoeing, tubing and many other swimming holes in this river as well. For photos and info, see BLUE SPRINGS , JACKS FORK RIVER . LAT, LON lat=37.05458, lon=-91.63844(source: DeLorme) (accuracy: exact) LINK TO GOOGLE MAP. TO get here from Eminence, take RT 19 south to RT 60 west then, just before Mountain View, take CR OO north (turn right). Where the blacktop ends go left on the dirt road and continue to the Jack's Fork River. CASTOR RIVER SHUT-INS [CAST]: (Also known as "Pink Rock"). Swimming places in a river canyon in the Amidon Memorial Conservation Area of Mark Twain N. F.. Crystal clear, deep water, huge pink rocks, and waterfalls. Lots of rocks so it could be considered a little dangerous. DO NOT GO HERE ON SUMMER WEEKENDS - IT IS REPORTED TO BE CROWDED AND OVERUSED ON WEEKENDS. For photos and info, see LINK TO PHOTOS . LAT, LON lat=37.57106, lon=-90.1576 (source: map) (accuracy: approximate) LINK TO GOOGLE MAP. To get here from Eminence, take RT 106 east to Ellington then RT 21 north then RT 72 east to Fredericktown. From Fredericktown, take RT 72 east a short way then continue onto RT J east for about 5 miles then turn south (right) onto RT W. Drive on Route W until the pavement ends, and then keep left on County Road 208. Continue on CR 208 until you see the Amidon Conservation Area sign then go left on CR 253. Take CR 253 until you see the parking area on the right. From here, the trail to the shut-ins is an easy one-third of a mile walk. (If you look on a map, there are what appear to be other ways to get here, but some of the roads end unexpectedly, so try to use this route.) Pretty confident. Not verified. Updated 2/2011. FLOAT CAMP [FLOA]: Mark Twain N. F. campground has picnic area and changing rooms and unofficial swimming in the Current River. Also lots of tubing including short tubing runs that dont require a shuttle. LAT, LON lat=36.66472, lon=-90.87139 (source: map) (accuracy: approximate) LINK TO GOOGLE MAP. To get here from Eminence, go east on RT 106 to Ellington then south on RT 21 to Doniphan. From Doniphan go 4.5 miles north on Highway Y. Go west on Forest Service Road 3210 for .5 miles to the Float Camp Recreation Area. Pretty confident. Not verified. Updated 2/2011. LESTERVILLE [LEST]: This is also in the East Fork Black River (as is the Johnson Shut In above) but downstream a bit. (Dont know if the flood mentioned above destroyed this one also.) LAT, LON lat=37.45000, lon=-90.82789(source: DeLorme) (accuracy: approximate) LINK TO GOOGLE MAP. To get here, continuing from the directions for the Shut Ins above, continue east on RT 21/29 to Lesterville. Near the bridge over the East Fork Black River, on the downstream side, we think, there is a swimming hole with (perhaps) a rope swing to drop from. BOILING SPRINGS [BOIL]: Short walk to a small springs boiling up into the Big Piney River with water play places as well as a deeper swimming hole with a rope swing nearby. The spring, which is shallow, has flat rocks making for an easy approach. The deeper swimming hole, with rope swing, is in the Big Piney just a short walk downstream of the spring. LAT, LON lat=37.46151, lon=-91.98767(source: Map) (accuracy: approximate) LINK TO GOOGLE MAP. To get here from Eminence, take RT 19 north to Salem then RT 32 west through Licking. About 10 miles past Licking, turn left on RT 2487 (Jacktar Rd.) and go about 2 miles then turn left (east) on RT 2480 (Boiling Springs Rd.) and proceed to just after you cross the Big Piney River where Boiling Springs will be on your left. There is a vault toilet here - no other facilities. There is boat access here also and the river is usually floatable downstream of the spring. PADDY CREEK [PADD]: A hike of less than 1 mile (round trip) along clean, clear Paddy Creek includes a dip in a swimming hole. LAT, LON lat=37.5478, lon=-92.0701(source: DeLorme) (accuracy: approximate) LINK TO GOOGLE MAP. To get here from Eminence, take RT 19 north to Salem then RT 32 west through Licking to Success then RT 17 north through Roby for about 2 more miles then turn northeast onto CR 7600, then go 2 miles south on FR 220 to the Paddy Creek Recreation site. There is camping and picnicking at the site. Park in the picnic area and walk back to the low-water bridge over Paddy Creek. The trail begins on the east side of the creek, near the bridge. After hiking about .43 miles you'll find a spur trail to the swimming hole - a deep pool at the base of a bluff with a gravel beach and picturesque setting. Return to the trail and continue on the loop back to the picnic area. 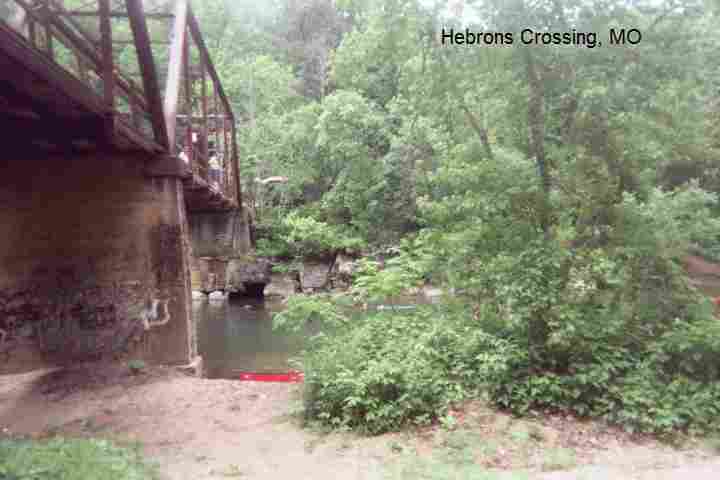 HEBRONS CROSSING [HEBR]: On the North fork of the White River, 10 miles upstream from Hammond's Mill Camp, there is an old bridge known to the locals as "Steel bridge". It's shown as Hebron's Crossing on most maps. The water under the bridge is deep, but it's deepest (and safest) to jump on the downstream side. It's about a 20ft jump into water that's 9-10 feet deep. The only big rock is clearly visible. PHOTO , PHOTO . This, along with Hammonds Camp, are popular stops on canoe trips. There is plenty of free parking, free camping, and only a out-house style restroom. No frills. LAT, LON lat=36.85174, lon=-92.18671 (source: map) (accuracy: approximate) LINK TO GOOGLE MAP. To get here from Eminence, take RT 19 south to Winona then RT 60 west through Mountain View to Willow Springs. From Willow Springs, take RT 76 west about 9 miles then RT 181 south (left turn) about 9 miles then go west (right) on RT AA, follow about 4 miles (where the road splits and turns to dirt stay right), follow the road down into the river valley. Cross the bridge and park on the down stream side. Pretty confident. Not verified. Updated 2/2011.